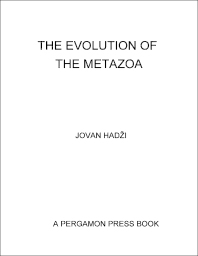 Zoology, Volume 16: The Evolution of the Metozoa presents the significant results of the Cnidaria research, their interpretations and implications in the field of zoology. This book is composed of four chapters, and begins with the establishment of the systematic position of the Spongiae, the position of Ctenophora in the animal classification, and Cnidaria as the only Coelenterata. The subsequent chapter deals with a critical survey of the interpretations of the origin and nature of Cnidaria, with emphasis on the morphologic proofs of its phylogeny. These topics are followed by an outline of the most probable reconstruction of the phylogeny of Cnidaria and the descriptions of the evolution of this metozoa. The final chapter considers the established classification of the animal world and the genealogical tree. This book will be of value to zoologists and researchers who are interested in evolution and classification of Cnidaria. Why is there no Medusa Form in Anthozoa? Is the Plasmodial State of the Acoela a Primary Element? Can Cleavage be Really Considered as a Proof of the Colonial Theory?